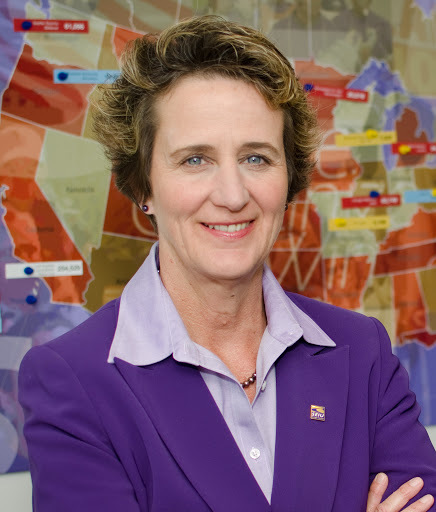 Mary Kay Henry serves as International President of the Service Employees International Union (SEIU), the fastest-growing union in North America, with 2.1 million workers in healthcare, public and property services. Henry has devoted her life to helping North America's workers form unions and strengthen their voice at work about the quality of the goods and services they provide, and the quality of care they are able to deliver. The daughter of a salesman and a teacher, Henry is the eldest daughter of 10. Henry grew up in a suburb of Detroit at a time when working people had a strong union voice that they used to build the middle class. Her childhood experiences in Detroit and her deep faith as a Roman Catholic instilled in her a deep commitment to opening the doors to opportunity for everyone and not just the few at the top. Since joining SEIU's staff in 1979, Henry has stood side by side with nursing home workers in Fresno, Calif., who fought for time to treat seniors with the dignity and respect they deserve, and suburban janitors in the Twin Cities, who wanted full-time work to support their families on a living wage. She has also worked with California state employees who sought to cut out waste and inefficiency from government, and registered nurses in Seattle, who wanted a partnership with management to improve the cost and quality of care throughout the state. Henry was elected to SEIU's International Executive Board in 1996 and as an International Executive Vice President in 2004. In her role as International Executive Vice President, Henry served as the union's chief healthcare strategist and led efforts to build a stronger voice for healthcare workers and enact historic healthcare reforms. More than a million healthcare workers nationwide, including registered nurses, technicians, doctors, and hospital and clinic workers are now united in SEIU Healthcare. In 2010, Henry was unanimously elected International President and became the first woman to lead SEIU. The Athena Center for Leadership Studies Power Talks feature today’s leaders in conversation on provocative topics of the moment. Each talk will be followed by audience Q&A. Come join the conversation.